For other uses, see Isidore. The film was adapted by Melvyn Bragg, Margaret Drabble, and Clive Exton from the books My Life by Isadora and Isadora, an Intimate Portrait by Sewell Stokes. It was directed by Karel Reisz. 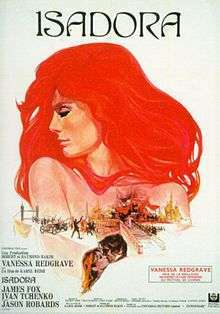 It was nominated for the Academy Award for Best Actress (Vanessa Redgrave). The film was also nominated for the Palme d'Or (Golden Palm) at the 1969 Cannes Film Festival, where Redgrave won Best Actress. In Berlin, she meets her first love, Gordon Craig, a young stage designer who promises her that together they will create a new world of theatre. After bearing the already-married Craig a daughter, Isadora moves to Paris and meets Paris Singer, a millionaire who lavishes gifts upon her and later buys her an enormous estate for her to open a School for Life, where only beauty and simplicity are taught. Following the birth of a son, Isadora returns to England with Singer but becomes bored with her quiet life and enters into an affair with her pianist, Armand. A short time later, both of her children are drowned when their chauffeur-driven car plunges off a bridge into the Seine. Broken by the tragedy, Isadora leaves Singer and wanders about Europe until in 1921 she receives an offer to open a dancing school in the Soviet Union. Unaffected by the country's poverty, she develops a strong rapport with the peasantry and has a passionate affair with Sergei Essenin, a volatile poet whom she marries so that he can obtain a visa to accompany her to the United States. Essenin's outrageous behaviour turns a press conference into a shambles, however, and US anti-Bolshevist sentiment turns to open hostility when Isadora bares her breasts during a dance recital in Boston. Following the disintegration of her marriage, she returns to Nice to write her memoirs. Impulsively selling her possessions to open a new school in Paris, Isadora goes to a local cafe to celebrate and spots Bugatti, a handsome Italian whom she has been admiring for several days. She goes for a drive with him in his sports car, and as they roar along a road by the sea, Isadora's long chiffon scarf catches in the spokes of a wheel and strangles her. ↑ "Festival de Cannes: Isadora". festival-cannes.com. Retrieved 7 April 2009.